Some of the premium parking spots cost $30 right near Wrigley Field – but are worth it in order to get out of there quicker. I had been on the road for 3 days without being at a hotel or sleeping in a bed thanks that Trip Reset. Thankfully that night I would have a hotel room in Milwaukee to sleep in for a few hours after the Cubs/Brewers double-header attempt. Before I had reached the Wisconsin border—I had to take the Detroit car rental to O’ Hare Airport back. At 5 AM in the morning I could pick up the new rental in Chicago, and then had to bring that specific car back the next morning at 5 AM. It was a continuous cycle of 24 hour rentals to consider as to not be charged for a second day. In my planning stages of the trip I had discovered a ‘loophole’ in Kayak’s car rental prices. A one-way car rental fee usually runs extremely high charges from city to city—so here was way to the avoid the excruciating fee by circumventing the rules. You just needed to rent cars from the one city’s airport-and return to another city’s airport within a 24 hour time limit. The fee was 10-15% higher than a daily rate, but so much less than the usual one way drop fee. If you booked the car one minute past 24 hours the second day would retroactive the 1st day back to include the huge fee for a one-way rental and lump both days with that high drop-off rate, meaning hundreds of dollars difference just by one mere minute. Time management was vital to saving money along with scheduling. I arrived at the ‘Amtrak Station’ right near the Milwaukee Airport (MKA). I had scouted this route of travel. 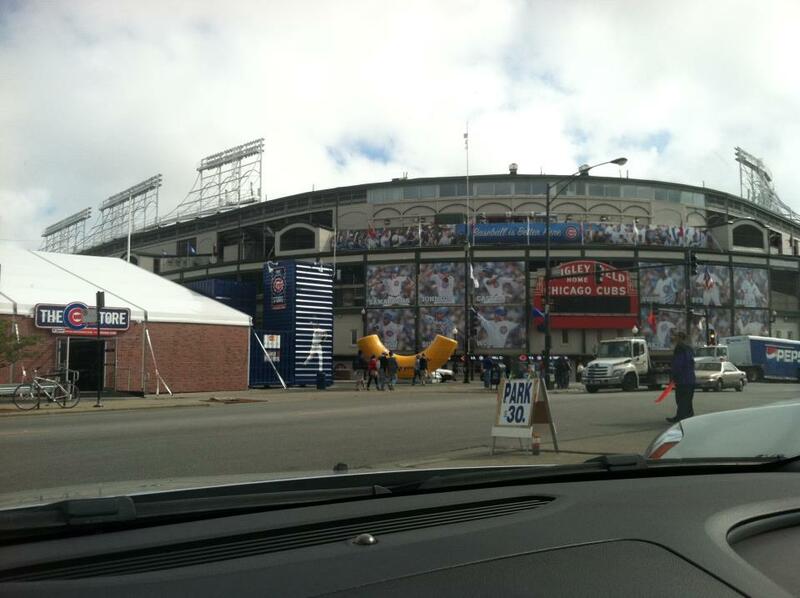 I was tipped off how to elude traffic by a member of the Chicago Cubs PR staff. Amtrak was the way to go. After further investigation I discovered this itinerary. Arrive at Chicago Union Station at 12:29 PM. Arrive at Monroe Station to transfer to the ‘Red Line Howard’ train. I made it to this station at 12:46 PM. I waited 6 minutes to board the train and make it to the ‘Addison’ Stop at 1:11 PM-which gave me 9 minutes to first pitch. I was supposed to have made the train 3 hours earlier but I needed to rest. The car was nicely parked back in Milwaukee at the Amtrak Station for a quick getaway after the return train. Sedan car service was to pick me up after the game at Wrigley before driving to Union Station in Chicago. I needed to make it the ‘CHI’ train station by 5:00 PM-to board the 5:10 PM train-to arrive back at the airport station in Milwaukee by 6:35 PM. I would then have 35 minutes to make 1st pitch at Miller Park. Since I had a few hours to kill in Milwaukee that morning I did a trial run to the park from the airport station following the directions of what I had learned from my 1st trip to Miller Park. National Avenue was the best way to drive off of HWY 94-E right to the ballpark. It was now 1:11 PM-and like exact clock work, I entered the historic ballpark of ‘Wrigley Field.’ Just like the 1st time I was at Wrigley Field I was in complete awe of the park. Recently they have put in a Replay Monitor in connection with the scoreboard. I am always surprised on how small the park really is in the stands and in the concourse. It is hard if you are a big guy like myself but the park makes up for everything. I will put up with the high prices for parking and tickets for the pleasure of watching the game for its true essence. The stores inside the park have something for every budget demographic to always take something home from this park when it comes to souvenirs. The food is reasonably priced and there is never a shortage of vendors roaming the stands with hot dogs and drinks. ‘Wrigley-Ville the community” is how this franchise has been able to maximize their earning potential without having a modern amenities park. There is basically a whole community around the ball yard that is dependent on the club to build its revenue streams and vice versa. Since the baseball park had no more space for fans—neighboring buildings created their own stands by adding seats to their buildings. Soon after that, pubs and restaurant sprung up in high-rise form – and the Cubbies are able to make money from all of it. The crowd control is managed by closing off the streets nearby—to let the ball park fans walk around freely and safely within these buildings. Chicago’s fans are the most loyal in baseball. The team has not won a World Series in over 100 years and the home games are always sold out. It is the biggest draw in the majors when it comes to events. The baseball game is almost secondary. Again this is not to suggest that the fans don’t care because they do. They are knowledgeable and follow their players religiously. It just means that the park is so gorgeous that a day at the park is still awesome if the team loses. The scenery is fantastic. Since there is not a lot of signs and such, I found the foul poles to really standout. I like sitting underneath the ‘Grandstand’ to watch the games. You should really take a full day to experience this community. I am going to return one day to do this very thing. I had to make sure I was focused on today. While most people were soaking up the entire day, I was hoping the game would end fast so I could leave Wrigley Field in enough time to make my train. I truly wished that is was the other way around—that I would have started the day in Milwaukee and ended up to see the Cubbies play at night. I was here now so there was no turning back. At least I had soaked up a lot more of the atmosphere the previous year. 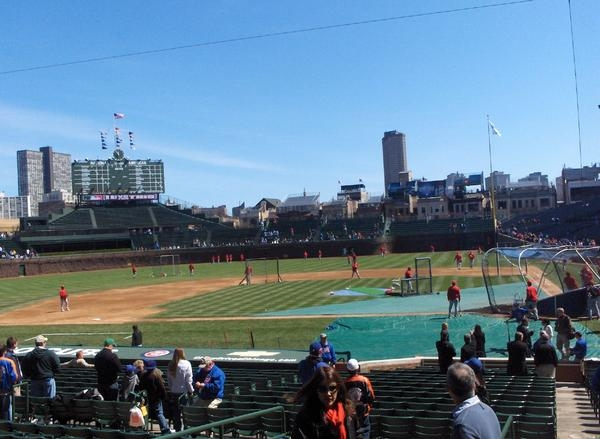 The Chicago Cubs were playing the San Francisco Giants. Jason Marquis was pitching versus Matt Cain. It was all the makings of a quick game. I really preferred the ‘NL’ teams because the pitcher had to hit. Sure enough I was right, after the top of the 7th inning—the game was going fast, but there was a problem, the game was scoreless heading into the seventh inning stretch. 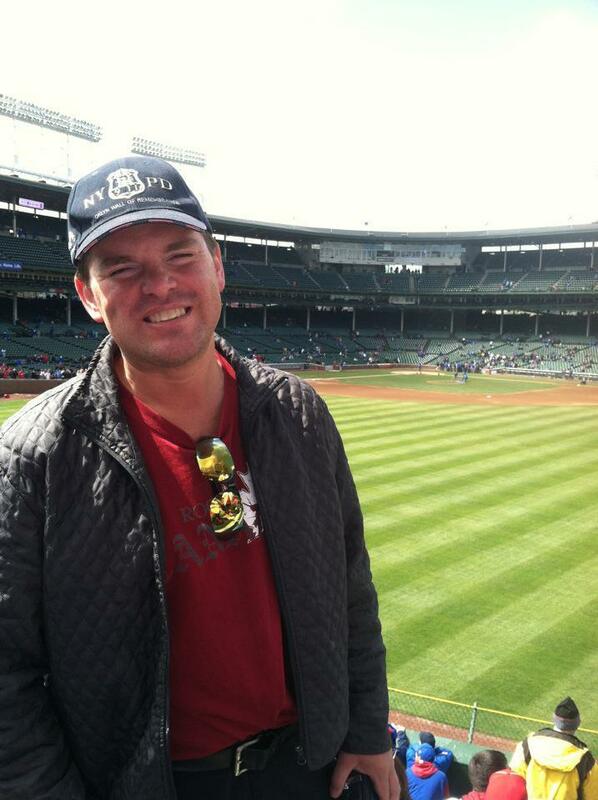 That event, made famous by legendary broadcaster Harry Caray is best watched at Wrigley. They now have a guest singer for every game now that Harry is no longer alive. You can feel the love and presence of his ghost somewhere as the crowd galvanizes in this tradition. The game was going along fast. It was only 3 PM. Heading into the bottom of the eighth there was still no score. Matt Cain, who had given up only 3 hits, was lifted in the 8th inning. Tyler Walker entered the game for the Giants and proceeded to give up 2 hits before Aramis Ramirez destroyed a 3 run HR. I was elated at this turn of events. It was 3-0 Cubs. As much I was happy I would reserve complete judgment until last pitch considering what had happened in Detroit the day before. “Here we go again,” I said as Kerry Wood came into the close the game and gave up an ‘RBI’ single to Bengie Molina. I could not take the nerves, at one point I turned away. Kerry finally shut the door down-and I was treated to a rendition of ‘Go Cubs Go.’ It is a song they sing after every Chicago home game which is as much of a tradition as throwing back an opposition’s baseball after a home run. I was caught up in the moment. I took my pictures for verification and was set to meet my sedan driver near the ‘McDonalds’ outside the park. The game was over so fast I called my sedan driver to see if I could be picked up early. I was swept with the flowing traffic towards the exit. It was one thing I really hadn’t accounted for. Wrigley Field is probably the hardest to exit after a game. It took 15 minutes to arrive at the fast food restaurant after leaving. A group of spectators had assembled around a man name Ronnie Woo Woo. For those that have not met this long-time Cubs fan Ronnie, you have not been to many games. He had been going to games since the 1940’s and is famous for yelling “woo! woo! Ronnie has had written and video documentaries that detail his life as a long-term fan of the ball club. The other fans love him dearly and often pose for pictures with him. I was happy to have met this man briefly while waiting for my sedan driver and how Ronnie ‘embodied’ what it means to support your ball team. Ronnie said an encouraging word to me and I finally received my phone call from the sedan driver. He actually saw me from a distance talking to Ronnie. Thank-You Ronnie!! We sprinted to the car down the road. Chicago traffic was a nightmare during Friday traffic and I was glad to not be driving to Milwaukee from the Chicago Area. The sedan driver was the same fellow who had picked me up from Midway Airport the previous week to complete the Minnesota/Chicago White Sox double-header. I watched the clock as the guy veered in and out of the traffic, making the subtlest of moves just to move one car ahead. I finally could see ‘Union Station’ and signed my visa bill for $61. I ran down the escalator to my boarding train flashing my ticket the whole way down. I made it! I had to stand, I was sweating profusely, I was much in need of a towel and a drink, but I made it. There would be no traffic to contend with, I could sit when someone would get off the train at future stops. Since it was Friday afternoon, there were business men going home for the weekend, families heading to Milwaukee for the weekend, others were going to a nearby town in the same manner as me in avoiding the traffic. I had spent $39 on my 2-way ticket. I would have had to park for that much near Wrigley Field. It was a 100 miles from Chicago to Milwaukee, along the drive I was dinged for around $8.00 worth of tolls collected at various parts along the way. Some were 80 cents, some were $3.00 and some were only a few miles apart. I was looking forward to Miller Park. Sitting amongst the crowd in Wrigley Field, makes it feel like you are in a Baseball “Time Warp”. A big thank-you goes out to our Baseball Schedule Correspondent Richie Devotie for doing the schedule portion of this blog. 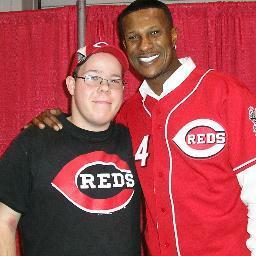 Richie grew up in Southwest Ohio and is a Cincinnati Reds fan. He has been involved with baseball since he was 10 years old, and now is 25. Richie loves crunching baseball numbers. Being a Reds fan the last few years has been very good to him as they are amongst the World Series Favorites for the 2013 Year – after winning 2 Divisions in the last 3 years in the NL Central. Posted on January 26, 2013, in The Rest: Everything Baseball and tagged @MrBaseballMan on twitter, Amtrak Train, aramis ramirez, bengie molina, chicago cubs, chicago union station, chicago white sox, Chuck Booth. fastest 30 ballgames, comerica park, detroit tigers, haray caray, jason marquis, kerry wood, la dodgers, matt cain, miller park, milwaukee, milwaukee brewers, minnesota twins, mka, nationals park, new york yankees, NL Central, O hare airport, petco park, progressive field, Richie Devotie, san diego padres, sf giants, Shea Stadium, todd jones, toronto blue jays, twitter @chuckbooth3024, wrigley field, wrigleyville. Bookmark the permalink. Leave a comment.